Unbelievable, but we’re seeing this remarkable phenomenon again. 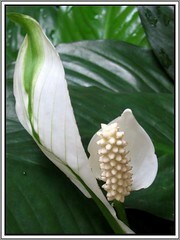 I can’t confirm whether it is from the same Spathiphyllum spp. ‘Wallisi’ plant that produced a similar flower previously in September 2006, but definitely from one of many plants, housed in the same pot. An inflorescence with 2 lovely white spathes (bracts), the usual large form and the other, stunted. The creamy white spadix on the other hand is also stunted and subtended by the tiny spathe, as well as growing unusually away from the large spathe. How marvelous is the beauty of nature and God’s awesomeness!